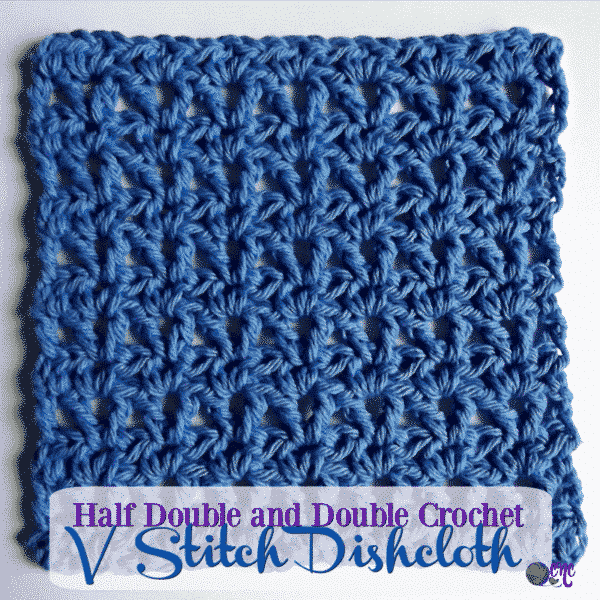 Today I have a half double and double crochet v stitch dishcloth pattern for you. 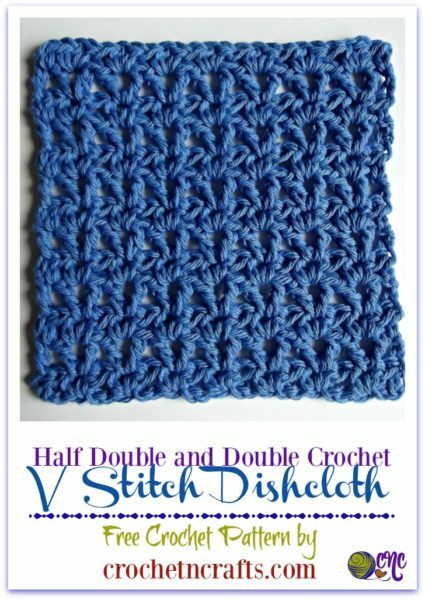 The v stitch can be made in a number of ways, and here I rotated the rows with the half double and double crochet v stitch. I like the final outcome of the two different rows as it’s not too open to use for dish or washcloths. With that said, you could easily do all rows the same with either the half double or double crochet stitches. Above is the right side pictured, but the wrong side looks great too. With that said, I prefer the looks of the half double stitches from the wrong side better. This is why I use the half double in so many patterns, it looks better on the wrong side than most other stitches. If you like this stitch pattern you might also enjoy this simple top. If you’ve been following my blog for a while you will know that I like my dishcloths on the small side. If you are the opposite, you can easily make this bigger in a simple multiple as outlined in the pattern. Or, make it smaller for a coaster for your desk. Or, even larger for a placemat for the kitchen table. It’s that easy to make a set for your kitchen. And, because it works up so quick and easy, you can make a set for your kitchen as well as to gift to your friends and family. Also, I did mine without an edging, which makes it quick and easy to whip up. But with a single crochet edging it looks much better. I would highly recommend an edging if using this pattern to make a coaster or placemat. 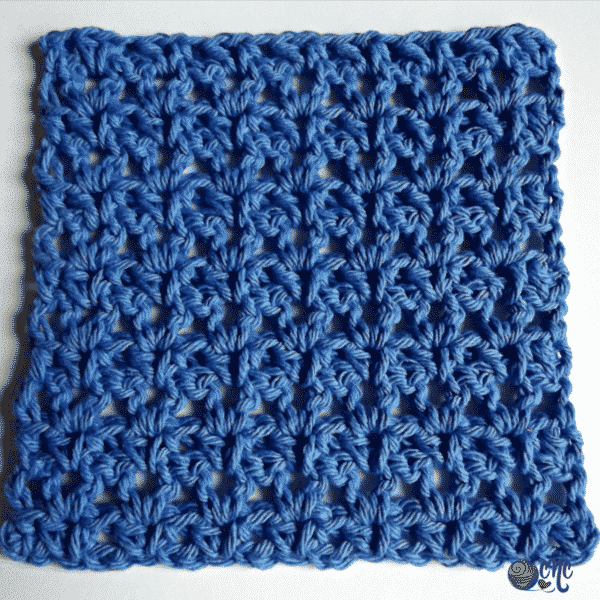 I chose a cotton yarn for this washcloth pattern, but feel free to use acrylic if you prefer that instead. Finished Size: 6.25″ by 6.25″ without an edging. Hdc V-st: (hdc, ch 1, hdc) in designated ch or sp. Dc V-st: (dc, ch 1, dc) in designated sp. Ch 24, or any multiple of 3. Row 2: Ch 3 (counts as first dc), dc v-st in first v-st and into each v-st across. Dc in last st. Turn. Row 3: Ch 1, hdc in first st, hdc v-st in first v-st and into each v-st across. Hdc in last st. Turn. Rows 4-13: Repeat Rows 2 and 3. Fasten off at last row. Add a single crochet edging. 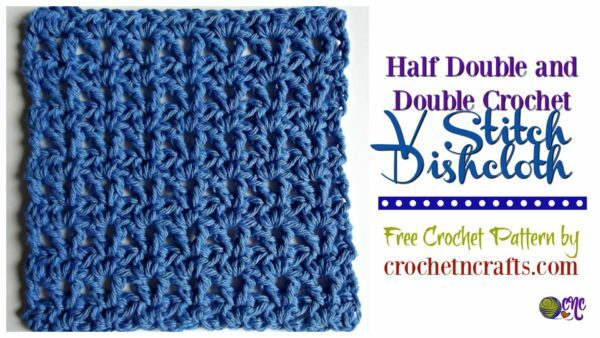 Here are more free crochet dishcloth patterns. Thank you for the V stitch pattern. It is working up very nice.